The difference in our approaches -- the Transition approach versus Ms. Salzman's approach -- boils down to "Who is going to lead?" Who is going to get this process started? Who is going to light a fire under the behinds of the American public to start getting local communities ready to weather these changes? Who is going to get people physically and emotionally prepared, and increase their resilience so that they stand a hope of surviving the worst of what this combination crisis threatens to bring? We in the Transition movement have stepped up to the plate. Perhaps this radical (root-level) difference in our approaches is because of what Rob Hopkins has called "the End of Suburbia moment." Transition movement leadership has, for the most part, hit that emotional wall already. We've each gone through it. Ms. Salzman clearly has not. In her Commentary, Ms. Salzman asserts that "This emergency has two parts: the climate change emergency, and the emergency that is being imposed upon us by ... congress at the behest of the fossil fuel industry [i.e. political issues]." Throughout both her commentary and her Critique, Ms. Salzman continues to focus primarily on one single issue: climate change. She does fold in a few other assorted societal ills, such as the fate of the poor, and governmental and corporate excesses, and pollution. But she completely overlooks the elephant in the middle of the room: Peak Oil. This March, Richard Heinberg pointed out that the U.S. Department of Energy has finally admitted that we're at peak. A diagram from the EIA (they provide statistics to the Department of Energy) has surfaced. For years, we've all been staring at ASPO diagrams -- the 2004 scenario, the 2005 base case -- the very real physical limitations, the fact that demand for and consumption of oil has completely outstripped new discoveries, and would soon outstrip supply. Each of these documents the oil age from about 1930 to 2050. The new EIA diagram is a detail of the very peak. Today. When I saw it, my heart stopped. And then when my heart resumed beating, it didn't beat quite the same way for the next couple of days; I walked around in a daze. I had thought that I had already experienced my "End of Suburbia moment" -- that precise time before which realization my life felt one way, and after which realization nothing would ever be the same again. Seeing the EIA diagram was my second such moment. It's really here folks. 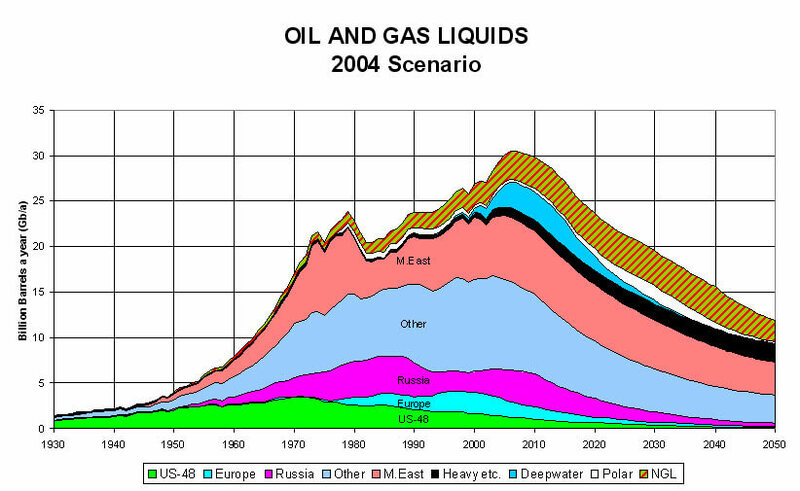 Peak oil is not just a future-possible-maybe idea. It's not some quack theory by a bunch of weirdoes making computer graphics. 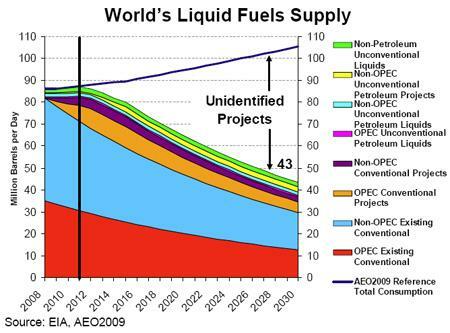 Peak oil is really happening. And since our government is finally 'fessing up to it (and we all know our government is unquestionably the laggard in this regard), then things are now really, really serious. So, Ms. Salzman, when you talk about time being of the essence, believe me, we in the Transition movement are very much aware that we've got far less than "very short." We haven't even got until your next election. We can't wait for the slow, endlessly-debated pace of government. No way, no how. "The time frame is ... very short"
Within the Transition movement, we know that our “crude awakening” is about much more than a few thousand barrels of oil spilled in the Gulf. We understand that it is far too late to expect to gear up solar and wind -- to have been effective, the time for planning and funding A Solar Grand Plan would have been 10 or 20 years ago, with construction and gear-up and implementation pretty much completed by now. We understand -- far better than you give us credit -- the mythology within the energy trading credits, which is precisely why you see so little commentary devoted to them in Transition materials. We understand -- far better than you do Ms. Salzman -- why nuclear power won't be our savior. The answer is peak oil. Nuclear is an oil-intensive process. Peak uranium aside, we simply won't have the cheap oil necessary to gear up nuclear to the capacity that would be needed. And all of the above are similar in one regard: they’re desperate last-ditch attempts to continue, at least for a little bit longer, a level of First World consumption that is completely out of line with the bounds of the planet. In short, within the Transition movement, we understand powerdown -- what, why, and how. We understand that it is far too late to go through all the hoops and hurdles that are our governmental processes to create grand sweeping plans at the national level. Actually, we're not shying away from governmental processes. We ARE navigating those governmental hoops and hurdles -- we're doing it to install community gardens and get permits for city chickens to secure the food supply; to gain cistern approvals and to overturn greywater bans to secure water supplies; to gain approval for composting toilets so that we can maintain soil fertility. We're actively doing the gear-up and implementation of community-level survival. And oh do we understand the importance of "confronting ... the overconsuming consumer society"! Rather than your rather detached intellectual understanding, we get this very deeply, because we are on the front lines. Daily, we're challenging our neighbors, challenging our peers. We're showing eye-opening movies to the general public and holding community discussions. We’re holding reskilling classes to educate people in the new ways. We're challenging each other, in a race toward deeper satisfaction, more contentment, more connection, sufficiency, and a sense of Enough. And we're witnessing the lights coming on behind the dull eyes. We're seeing the Aha moments when people really "get it." We're seeing the changes start to happen. Peak oil changes the playing field. Radically. Ms. Salzman, when you worry about confronting "those forces that are responsible for ... the magnitude and imminence of the global ecological crisis," that is history, that is fault-finding after the fact. The Transition movement is worrying about the future: next week, next year, the next 3 years. It is setting in place the things we need to survive. Ms. Salzman, you worry the "policies and funding decisions ... [that are being made] in congress, corporate boardrooms, Wall St. and the headquarters of institutions like the IMF and World Bank." Yet the End of Cheap Oil means that each of these organizations is on COMPLETELY different footing than a mere decade ago. The rules of the old playing field said that globalized corporate powers had lots of clout. But today within those corporate board rooms, there is now a very subtle panic. They know the game is changing. You can see it in the mergers and the restructuring and the panics about financing. You can see it as they move premises to consolidate operations, leaving massive pieces of real estate with fading For Lease signs. And corporate employees feel it in increased tensions within the internal organizations. The corporate boardrooms know the game is changing, but most of them don't know why. The why is "peak everything." I explained it in "How to get to 350ppm," but you seem to have missed that part in your reading. In addition to peak oil, peak arable land, and the coming peak natural gas, "peak everything" also refers to the intangibles of our society. We have now crossed peak government, peak corporation, and peak globalization. And each of these organizations is experiencing an initial post-peak panic. Excuse me here – I’ve been accused of having “a resistance to hard intellectual work” (and don’t throw that one at Transition movement founder Rob Hopkins who is working on his PhD). But in my own personal view, when our city of Los Angeles has staggering debts, our state of California has staggering debts, and our national government has staggering debts, I think that too changes the playing field. Radically. Peak oil people tend to look to Cuba as an example of what is to come with the End of Oil. We should also be looking to Greece as an example of what happens as we come to grips with the reality of our government's past spending habits. Peak government is certainly upon us. Far from OMITTING considerations of government from our calculations, the Transition movement is much more realistic about the limits that government will be facing through peak oil + climate change + economic contraction. They can’t do it for us. It really is up to us. We know, from our own internal experience within the movement, that government is desperately looking for answers. In many cases, THEY are seeking US out. We don't need to pursue them. Here in my local Los Angeles, government agencies are asking us to come in and speak, particularly the ones in lower income neighborhoods. We’re working WITH local governments as they turn to us to create citizen momentum so that they can create food gardens on public lands; they comprehend the need but require citizen demand in order to act. In the UK (who are a bit deeper into the Transition process than us U.S. latecomers), local governments have embraced the EDAPs. In the UK, Members of Parliament have been invited to (and have attended) Transition Conferences. Not as keynote speakers, but as Keynote Listeners! A brilliant concept, fraught with that unique British humor, but something we have explored here in my local area and will continue to do so. Government in our country is supposed to be democratic. Well, here in the Transition movement, we're working with the demos part of that equation. "Immediate actions that need to be taken"
In both pieces, Ms. Salzman, you assert that the Transition movement hasn't told you what to do. I can't quite understand how you don't get that, unless it is that (1) we haven't told federal GOVERNMENT what to do, and (2) the list of immediate actions required doesn't fit neatly into a "10 things ya gotta do" list. The answer to “What to do NOW” appears throughout all the Transition materials: Gather your community. Explain what is happening, tell it like it is. Start getting ready. Start building resilience. Do the physical stuff, like installing food gardens and water devices. Do the intangible stuff, like recouping much-needed hands-on skills and rebuilding a local economy. Do the inner work, like coping with emotions and disappointments and broken dreams. Reconnect spiritually. Reform society. Get ready. It's here. No, it doesn't fit into a nice little to-do list to fly on a glossy blog. The general list looks – well, pretty “broad, general and abstract” -- just like you said. The detailed list is, in fact, fully customized for every single community. Here in Los Angeles we laugh that the UK folks never seem to include water on their lists; for us it’s pretty much the top. I don't know how one would cope with the weather in Wisconsin; here in L.A. we worry how to maintain perpetual soil fertility through a year-round growing season. We need to cope with pest control (without petrochemicals) when all the East Coast-authored garden books presume you'll get a hard freeze to kill the bugs. We need to consider earthquake supplies; they don't do that in Kansas. As for intentionally creating higher energy prices – which you cite as “the single most important first step that needs to be taken” – that isn’t even on our to-do list (nor should it be on yours if you really care about the urban poor). In the interim, we’ll USE those currently-low energy prices while we have them -- to further post-petroleum preparations, hauling the materials for cisterns or breaking up urbanite in the inner city. “What NOT to do”? Don’t wait for someone to do it for you. Don’t wait for someone else to get things started in your hometown; get the ball rolling now, yourself. Don’t dismiss it as a solo survivalist journey; we’re all in this together, even people who don’t look like you in skin color and culture of origin. And there’s no point in resisting: You will have to change your petroleum-dependent lifestyle anyway, very dramatically and very soon, so you might as well jump on board with the leaders and get to participate in all the fun. As I’ve said numerous places, including on this blog, climate change and the End of Cheap Oil will affect every aspect of human endeavor. For this I like to refer to David Holmgren’s Permaculture Flower. Tools and technology are changing – that’s an obvious one. But so must economics and finance; thus we’re helping to empower one of Los Angeles’ poorest Spanish-speaking neighborhoods by setting up a local economic system. Health and spiritual well-being must change; we’re working with alternative healers toward sustainable, petroleum-free care, and working with interfaith networks to get powerdown ideas into faith communities. Culture and education must change; we’re making an effort to bring powerdown ideas and post-petroleum education to all citizens, including low income and marginalized populations. Transition initiatives work with all these changes, networking local organizations which may already be active in the issues, and helping them see how they fit into the overall picture. The lists of immediate actions are voluminous, and they are being created by each individual Transition Initiative. As for worrying about carbon taxes ... well, it’s about priorities. Let’s just say there are a few other things we're worrying about quite a bit more! Ms. Salzman, what I see here is, you're trying to change government. All power to you, and I sure hope you succeed in your endeavor. It would be handy. Meanwhile, I'll go back to my trenches in my little corner of the world (and my fellow Transition leaders will go back to their trenches in their various little corners of the world). I’ll pick up my shovel, and we'll get back to it. We have a society to transform, neighbors to prepare, and communities to rebuild. p.s. My teenage son comments that in the photo above, the lady’s shovel is much too clean.